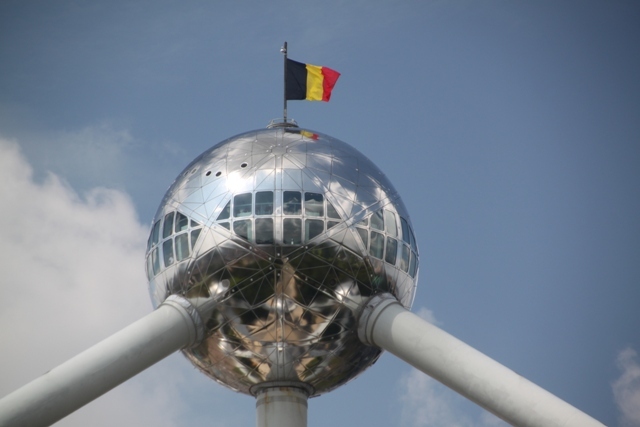 The Atomium, one of Belgium’s most famous landmarks was something I really felt we should see while in Brussels. 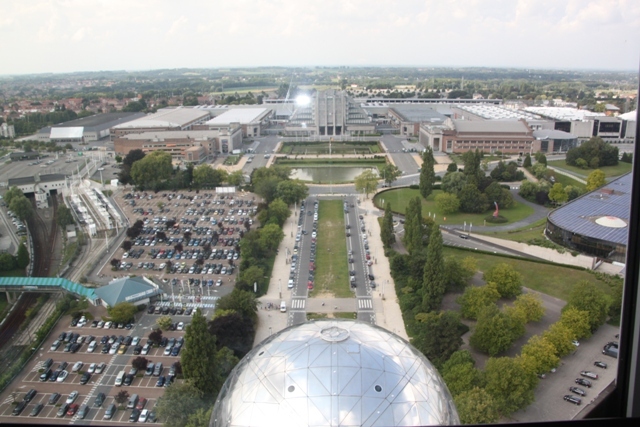 Standing at 335 feet tall and built in 1958 for the World Fair in Brussels, it is a bit like a glimpse of the future from 50 years ago. We walked the short distance from Mini-Europe and carried on beyond the structure to get the best views of those nine spheres. Apparently it mimics the atomic shape of an iron crystal magnified 165 billion times, Son thought it was like a giant K’nex creation. Super crowded by the entrance, I felt relieved we had pre-purchased our tickets – until we got inside. We joined the end of a very long, very slow moving and very boring line – this was to go in the elevator to the top sphere. 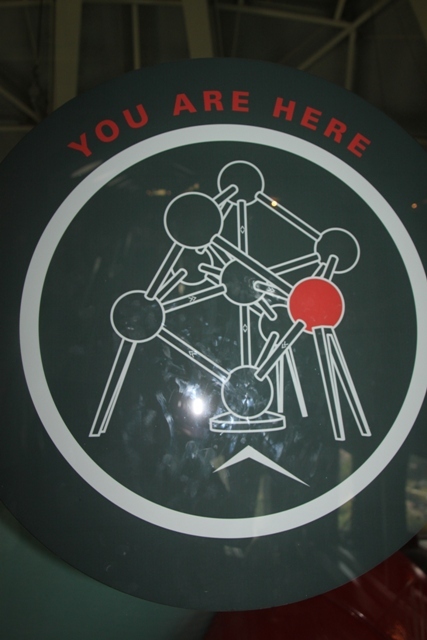 It was incredibly hot, incredibly dull and had I known about this queuing in advance I would definitely have given the inside of the Atomium a miss – admiring from afar outside would have done it for me. Forty five minutes later in sweltering heat and not the best of moods we entered the elevator to be whizzed right to the top. At least the glass roof was a distraction and quite impressive. We emerged into the top of those spheres, a viewing area but which was also crammed full of people. Bad enough but worse for me was the weird sensation that the whole thing was ever so slightly swaying. Husband and Son thought that was “cool”, I thought it was freaky and nausea inducing. Reasonable views too but not the spectacular Brussels panorama they promote. We took the lift back to the ground level and then used a mixture of steps and escalators to explore the remaining spheres. 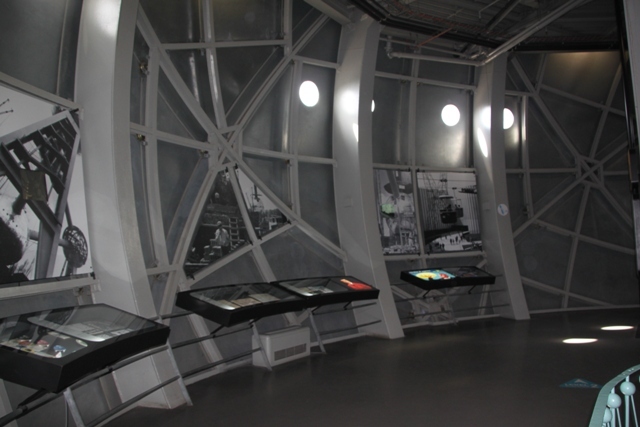 An exhibition on the World Fair of 1958 and the building of the Atomium was interesting, the rest was a bit lacking I thought. Son enjoyed a slightly weird light and music show in the second sphere but my favourite part was the views from the windows of the other giant balls close up. We didn’t really spend too long inside the structure, most of it actually in that first queue. Still, the ice-cream shop at the bottom was given a thumbs up all round. 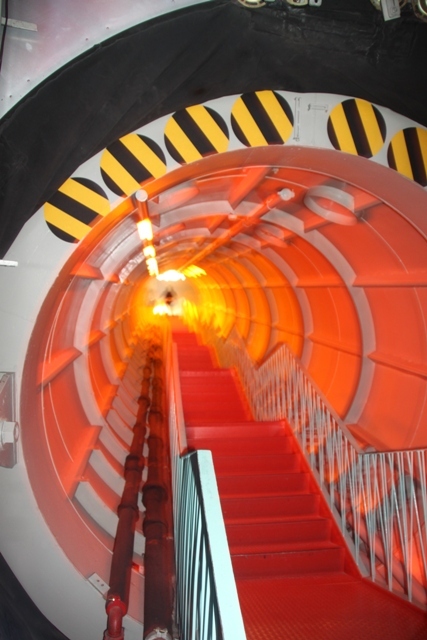 An interesting experience, I have seen the outside of the Atomium on numerous past trips to Brussels and was always curious about exploring inside. Now I can say I thought it probably wasn’t worth the money. This quirky giant atom is, I think, best admired from (a little way) afar. Thank you for solving the mystery of your previous post, Joy – I’d been wondering what this structure was all about and what it looked like inside. Pity it was a bit of a disappointment. Your blog is such a wonderful source of information about interesting places to visit – I always enjoy popping in here. Thank you so much Reggie for your lovely comments!! It was a bit of a disappointment inside but I’m glad we checked it out – at least now we know!! The outside is definitely not disappointing though.. Thank you!! It’s a quirky subject and great fun to take pictures of something like this. The crowds were so intense when we visited Tanja and that, combined with the heat just didn’t set us off very well. 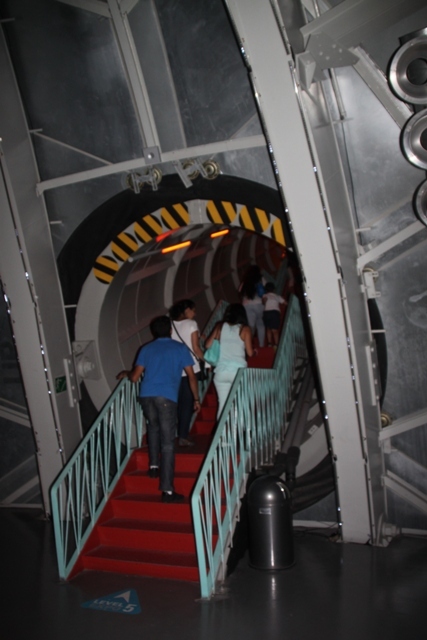 I think standing in a line for 45 minutes just to go up in the lift just really didn’t bode well….. Glad you enjoyed it though, we still loved the outside and were glad we visited. We also went inside a few years ago. It’s impressive from the outside, but the exhibitions inside are really rather dull. Wow! That is impressive, Joy!!! I am sure it was paradise for your son!!! Fun to explore and check out inside which giant sphere you are currently in!! We also found a children’s party/hotel area in one of the spheres, he thought that looked like a fun thing to do!! Sounds like it was a great exhibition – anything to do with either World War fascinates me. Totally agree…. mountain top views seldom disappoint!! I’ll give it a miss then! Check it out from the outside, forget about the rest! 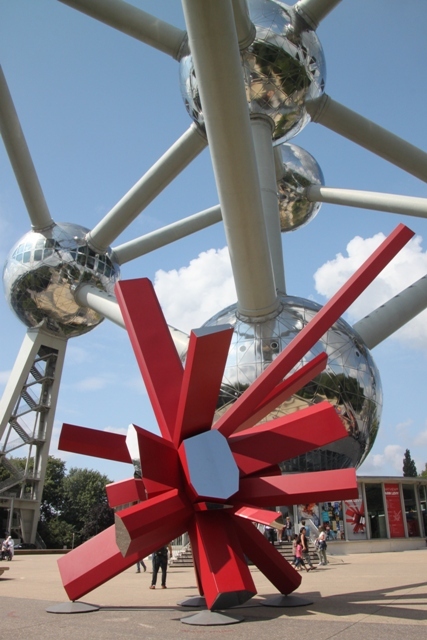 great post and photos Joy 🙂 As Reggie says in your first comment, I too have always wondered what the Atomium was all about, and now I know, I don’t think I’ll be going out of my way to visit it! Great to look at from the outside, so quirky and unusual but really disappointing and just a bit dull inside… I wouldn’t recommend!! I love all your pictures today – great angles! (The last one reminds me of something Miss G. would do!) the atomism looks like that 1950s Sputnik chandelier – seeing those everywhere again these days. You are spot on when you say it looks like the future from the past – such a funny concept but fascinating! When I went we got there after it had closed, unfortunately, so I didn’t get to go inside 😦 Thanks for posting these awesome photos! Almost makes me feel like I was there myself! As long as you saw it from the outside Shelly I don’t think you missed a lot actually. We felt the exhibitions and interior were a let down, the outside is a different story! The future from fifty years ago…that’s so right on..:) such an interesting looking place. We had a ball here too George!! Quirky and unusual, this is such an intriguing building. An anti-climax inside for sure Anabel, wish I’d stuck to the outside!! 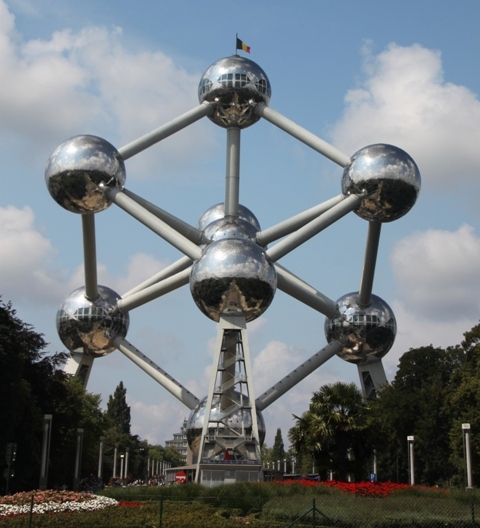 Joy, I wasn’t aware of the Atomium, but you have enlightened me! I am with you, I cannot stand in long lines with sweltering heat! At least you have now seen it up close and personal! Not sure it was worth it – from the inside Pam, that queue was a killer!! Like you say though, at least we know!! What a pity that the experience of the interior was so deflating given the intrigue and impact of the exterior. I will considered myself warned not to waste my time or money should I find myself in Brussels. The outside is so impressive and such a wonderfully different building, we were expecting to be wowed by the inside too, it definitely did not do that!! If you are ever in Brussels check it out from the outside Laura, leave it at that would be my advice!! It’s an incredible looking structure, Joy – but I would never have been able to persuade my husband to queue up for that long! I was only able to persuade mine Susan because we’d already bought our tickets – and that was a job too, we were on the verge of leaving anyway…. and then it didn’t live up to our expectations!!! You saw the best bit – the outside is incredible, the inside a bit dull really but I always wondered too!! You’re not the first person to be disappointed with the interior. 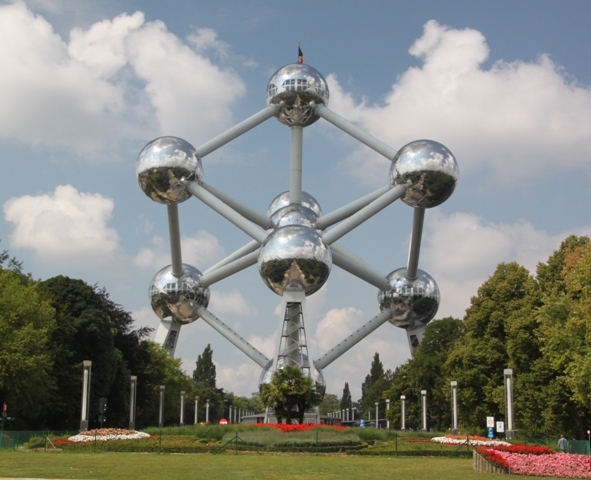 I think the Atomium is definitely an interesting structure to see, it’s a bit weird but I kinda like it! The queues and the crows sound horrendous though. Think I’d give it a miss! I love it too – but from the outside – just far too many people and just a bit dull inside! 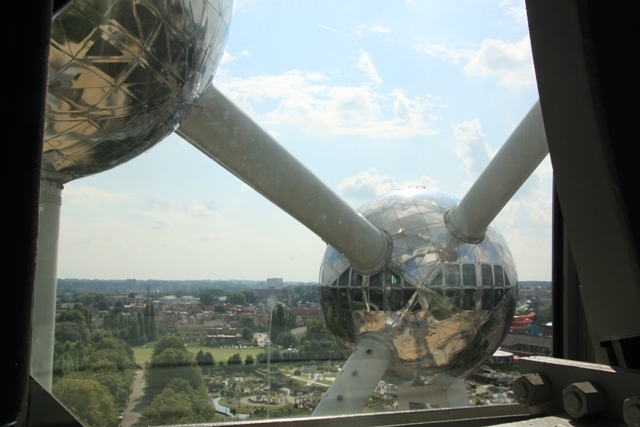 I was disappointed by the atomium as well, a lot of line waiting for a little bit of escalator riding. But I agree, definitely worth checking out from the outside! It’s extra disappointing I think since the outside is so different and quirky! Missing a trick here I think they are!! I went in 2003, and remember thinking the inside was bizarre. I got a key ring of myself with a bloke dressed in a tiger suit – weird! But that’s the sort of key ring you would never throw away!! Love it!! You do get around! This was an exciting tour, thank you! 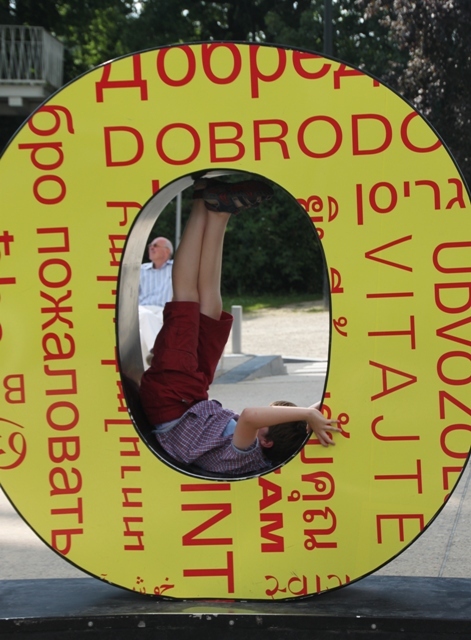 It’s a fun structure from the outside – kids love it – and adults too!!! It is spectacular Rosemary – from the outside!! Shame about the exhibitions, I think they are missing a trick here, something that attracts so many people and looks so good, yet so dull inside, it’s a real shame!! We have had sunshine all week and more promised for the weekend so everyone is smiling!! Hope your weekend is lovely too. Thanks for this Joy! I think we’ll take a look outside when we go and if the weather is bad then pop inside. If not, might skip the inside.